Read an exclusive interview with the superstar artist! This July, writer Nick Spencer and artist Ryan Ottley begin a new era in the history of AMAZING SPIDER-MAN. Get an exclusive first glimpse at Ottley’s work in AMAZING SPIDER-MAN #1 below! But first, hear the artist’s thoughts about jumping headfirst into the world of Peter Parker. Marvel.com: Ryan, big question—what’s it feel like to be the artist on the most famous comic book of all-time? As your first work for Marvel no less! Ryan Ottley: Spider-Man was my gateway into the world of comics so it definitely feels full circle, I’m drawing what I always dreamed of drawing when I was a teenager. And to be honest, I’ve been drawing super hero comics so long on “Invincible” that I thought this would be business as usual drawing super heroes but that kid in me is having a lot more fun drawing these characters than I thought I would have! The change to a new project was a much easier transition than I anticipated. Thank goodness! Marvel.com: Coming off your epic run on “Invincible,” where you helped create the universe, how does it feel to enter a world that’s already formed? Ryan Ottley: Honestly, it’s not too much different. I’m very used to drawing people in tights and doing my best to make it look badass—that’s the main job of a super hero artist, make something like people wearing tights and capes (which would probably look silly in real life) look awesome in your own visual style. Marvel.com: Has your process changed for this project? Ryan Ottley: No, I think my process fits this new gig perfectly, just jumping in head first and trying to bring these characters to life is the only way I know how do it. Marvel.com: What new challenges come with drawing Spidey? Ryan Ottley: Showing emotion through the mask. That’s always difficult. I don’t want to make the eyes move and squint, I always thought that was kinda silly. I like some amount of practicality in my fiction—not overly practical, but enough. 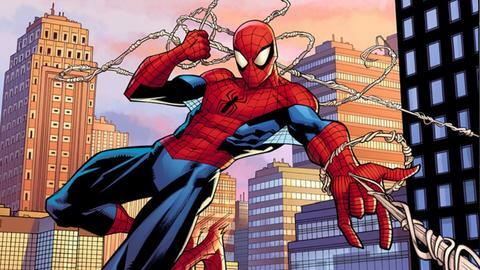 Marvel.com: Are there any previous artists on Spider-Man that you’re drawing inspiration from? Ryan Ottley: Well I’ve always loved the way Todd McFarlane and Erik Larsen drew Spidey, with the larger eyes and the crazy poses and webbing, so I will always be influenced by those few things. But I am trying to keep this stuff me. If you’ve read “Invincible,” you’ll recognize me on Spider-Man and how I emote and set mood and pacing. Marvel.com: How do you hope to add to Spider-Man’s legacy visually? Ryan Ottley: The only thing I hope about a book is that I can keep up with the deadline. That’s the hardest part. Everything else is void of hope, it’s more just doing what you do the best way you can, and if it works on exciting the readers, then the Spider-Man legacy is going to be fine. So I’ll do my best and I’ll do it in the way I’ve always wanted Spider-Man to look and feel and I’ll have a blast while doing it. And here it is…the first ever inside look at Nick Spencer and Ryan Ottley’s AMAZING SPIDER-MAN #1! On July 11, crash into the start of a new era with Nick Spencer and Ryan Ottley’s AMAZING SPIDER-MAN #1! And stay up-to-date with all the exciting news coming from Marvel Comics right here!